We are a family of caregivers, whose mission is to provide our clients and their families with peace of mind through compassionate, qualified caregivers in the home. We require no deposit or minimum hours, and are sensitive to the needs and feelings of you and your loved ones. We are based in Upland, CA and provide Los Angeles, Orange, Riverside and San Bernardino counties with experienced, compassionate home care professionals. San Bernardino, Riverside, Los Angeles and Orange Counties. Oasis In-Home Care was established in 2002 to offer an affordable alternative to seniors and the disabled who want to remain in the comfort of their homes but need a little help to be independent. Clinical research has revealed that people recover very quickly and most adequately in the privacy and comfort of their own homes. However, today's busy lifestyles can deprive family and friends of the time and energy required for a loved one to remain safely at home. Fortunately, Oasis In-Home Care has answered the call! Seniors and the disabled can now enjoy the comforts of their homes for as long as possible. We can help your family avoid the exceptional trauma associated with leaving their cherished home to a nursing home. We are certified by the American Board of Home Care and Licensed by the State of California. With no hourly minimums or deposit required, Oasis offers a higher level service and benefits than most other available options. "We have used their services for over three years and couldn't be happier." DARLING S.
"Should you need this kind of assistance with a family member, you can do no better than this group of dedicated, competent and kind professionals." 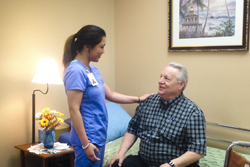 - TERRY S.
"I found Oasis to offer qualified and caring people to care for my loved one. I recommend them very highly. " - PATRICIA O. "I would hire Oasis again in a heartbeat" - JANINE W.
"Wished I had known about Oasis the first time home care was needed for my husband." - CAROLYN E B.